Looking back on the blog, I realized it has been MONTHS since I posted. I honestly can't really remember the last time I shared a recipe with you here...a lot has changed in my life and I while I continued to cook and bake and feed my family and friends, I just couldn't find much motivation (or free time) to sit down and share it here. Since I last posted, I've taken on a new full-time role at my job (which I love), my daughter has started kindergarten, we became first-time homeowners and moved into our beautiful new home within walking distance of Winona Lake and gorgeous parks. Maybe that's why today when I tried Gesine Bullock Prado's recipe for simple Maple Cookies I felt like sharing. These are delicate, crispy cookies that remind me a little of the simplicity of shortbread with a subtle maple flavor. You can cut them in any shape you like...I was trying to find a leaf cookie cutter but all the shops near us have already turned everything over from fall to Christmas! So I went with a snowflake...as the chilly rain drips down my windows I can't help but wish for snow as I munch on one of these delightful crisp cookies, washing it down with a hot cup of tea. Cream together the butter, 1/2 cup of the sugar, and the maple syrup until light and fluffy. In a separate bowl, whisk together the flour, salt, and cornstarch. Add the flour mixture to the butter mixture all at once, mix on low until the flour is just combined into the dough. Press the dough into a disc and wrap it in plastic wrap. Refrigerate the dough for 1 hour. Roll out the dough on a well-floured work surface to about 1/8" thick. Cut out cookies and place on parchment-lined cookie sheets. Sprinkle the cookies with the remaining granulated sugar and bake until the edges are just golden brown - about 15-17 minutes. I want to preface this post by saying that my husband hates few things as much as he hates bananas...peas are a close second! However, my brother-in-law loves banana cream pie so of course I wanted to make one for his birthday. My younger sister is a wizard with cake so we traded off...I baked a pie for her husband and she baked up something chocolate and banana-free for my husband. Perfect! We celebrated with an evening of games, dessert, booze, snacks and laughing so hard we almost choked. 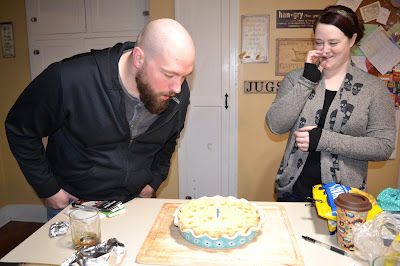 The banana cream pie is fantastic and I definitely will be making it again, check out the awesomely easy and super-tasty recipe courtesy of House Of Nash Eats. We're in February, that month where winter seems to really drag on and on, so I'm craving something light and fresh to brighten up my palate and my mood! 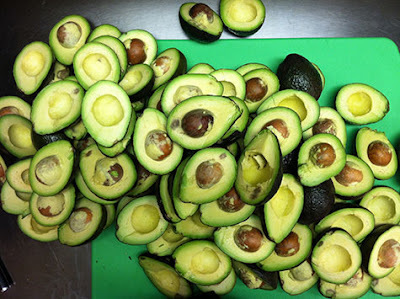 Thankfully it's also "Superbowl" season so I can get my hands on a ton of cheap avocados thanks to our country's sportsfans' love of guacamole while they watch the big game. 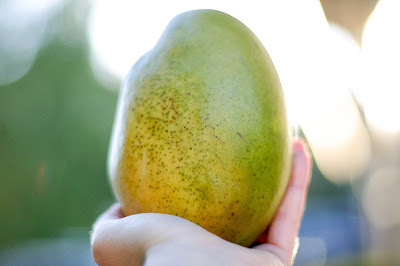 Mangoes can be hard to come by this time of year, but I lucked out at the market and was able to find a few that weren't hard as rocks! Check your local Asian grocery stores too, they might surprise you. This is one of my favorite recipes to make in the summer, but if you can find the produce it's fantastic year-round. You can swap out the salmon for chicken or sturdy white fish and no matter which protein you pair it with, that coconut rice is addicting! Whisk together olive oil, lime zest, lime juice, garlic and season with salt and pepper to taste. Pour into a 9x13 baking dish and add salmon. Cover and allow to marinate in the refrigerator for about 20 minutes, then flip the salmon over and let it marinate another 20 minutes. While the salmon is marinating, you can prepare the coconut rice. In a medium saucepan bring coconut water, coconut milk, rice and salt to a full boil. Cover and simmer until liquid has been absorbed, about 20 minutes. Fluff with a fork, then let rest 5 minutes before serving. You can prepare the salsa ahead of time or put it together while the coconut rice is cooking. Toss together the mango, red pepper, coriander, onion and avocado. In a small bowl whisk together the lime juice, olive oil, coconut water and a big pinch each of salt & pepper. Note: I don't have an outdoor grill so I used my cast iron grill pan for this - either way works just fine or you can just sear off the salmon in a nonstick pan on your stove! If using a grill or grill pan to cook the salmon, brush grill grates with oil. Otherwise add about 1 tbsp. olive oil to your pan on the stovetop. Place salmon on grill/pan and cook about 3 minutes per side or until just cooked through. Serve salmon warm with coconut rice topped with avocado mango salsa. Time for another pie! This one is a delicious savory-style pie from the fabulous Gesine Bullock-Prado's cookbook "Pie It Forward". If I had the time I swear I would do a "Julie & Julia"- style thing and cook through the book cover to cover. Every recipe I've tried is fantastic so if you love pies and haven't checked the cookbook out yet, definitely see if you can grab a copy! Cajun spices are fantastic and a definite favorite in this house. My husband requests jambalaya every year on his birthday and we've been known to celebrate with it on New Years Eve too. I want to give gumbo a try sometime soon, but this recipe for Low Country Boil Pie caught my eye. Full of those delicious Cajun flavors we know and love, it blends peppers, corn, andouille, shrimp, potato and cheese into a one-crust savory pie that quickly became a must-have at our dinner table. Serve it up with a big green salad (plus a cold beer) and you'll be ready to dig in! Pulse the flour, salt, sugar and butter together in the bowl of a food processor until the mixture resembles cornmeal. Stir together the ice water and lemon juice in a small bowl then add slowly to the flour mixture until the dough just comes together. Turn out the dough onto a lightly floured surface and gently press into the shape of a loose disk. Wrap the dough in plastic wrap and let it rest in the refrigerator for 20-30 minutes. Preheat the oven to 350 and roll out your pie dough on a lightly floured surface before transferring it to line a 9" deep-dish pie plate. Dock the dough and freeze it for 20 minutes. Line the crust with parchment paper, fill it with pie weights or dried beans and bake it for 15 minutes. Remove the weights and parchment then bake the crust for 5-10 more minutes until that raw-dough sheen goes away. Set aside. Bring the chicken broth, Cajun spice, cayenne pepper and butter to a boil in a large saucepan. Stir in the grits and whisk well until combined. Reduce the heat to low and simmer until the mixture thickens (about 8-10 minutes). Peel the potato, place it in a small saucepan filled with water and boil until it is fork-tender. Cool the potato and cut it into 1/2 inch cubes. Stir the cheddar, cream, pepper, jalapeno, corn, andouille and potato into the grits until combined. Whisk the eggs in a small bowl just to break them up before stirring them into the grits mixture. Add salt and pepper to taste then stir in the shrimp. Pour the mixture into the crust and bake at 350 for 35-40 minutes, until the custard is set. Let cool 5-10 minutes before slicing and serving. I also recommend you place this pie on a rimmed cookie sheet before baking, as it has a tendency to spill over while baking. It's January so at this point I'm already sick of root veggies and apples, yearning for Spring and Summer produce. I love winter weather but the local produce scene here in Northern Indiana during these frozen tundra months is woefully root-themed. This is a great time of year to experiment with those root veggies and make dishes that satisfy that "new" craving I have when I just can't eat one more roasted piece of squash! We're also well past the inundation of "pumpkin, pumpkin everywhere" so I feel like I can circle back to it safely. This recipe is a simple risotto, which sounds kind of intimidating but honestly let's just call it creamy rice because that's what it is! I have an awesome go-to risotto recipe I love to make that has minimal stirring and you don't have to babysit it on the stove, but I wanted to try something new. 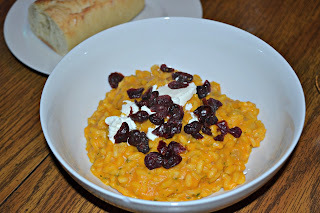 This pumpkin risotto is fantastic. Not only do you get in a great squash-like veggie, but the creaminess of the risotto topped with a little of that fabulous funky goat cheese elevates the entire dish! If you're making this for your family and have pickier kiddos, just leave off the goat cheese and see if they'll go for the plainer version. Honestly it's fantastic either way and super-filling so I like to serve it up with a big green salad and a glass (or 2) of white wine. Cheers to pumpkin being savory and not featured in every beverage on the menu! Whisk together the vegetable broth and pumpkin in a medium saucepan over medium heat. Bring up to a simmer, then reduce the heat to low just to keep it warm. Melt the butter in a large dutch oven over medium heat. Add in the onion, salt and a sprinkle of black pepper. Cook until the onion is translucent, then add in the thyme and rice and cook for one minute longer. Add the white wine vinegar and a ladle of warm stock and cook, stirring occasionally, until the liquid has evaporated. Add another ladle of stock, and continue cooking until evaporated again. Continue cooking, adding a ladle of stock at a time, and allowing to evaporate in between each addition. Cook until the rice is cooked, but isn’t mushy. Should take about 20-30 minutes. Remove from the heat then stir in parmesan and nutmeg. Taste and add additional salt and pepper if needed. Serve topped with the goat cheese and dried cranberries.